« ‘New branches on the Tree of Life’-April 14th, 1945. 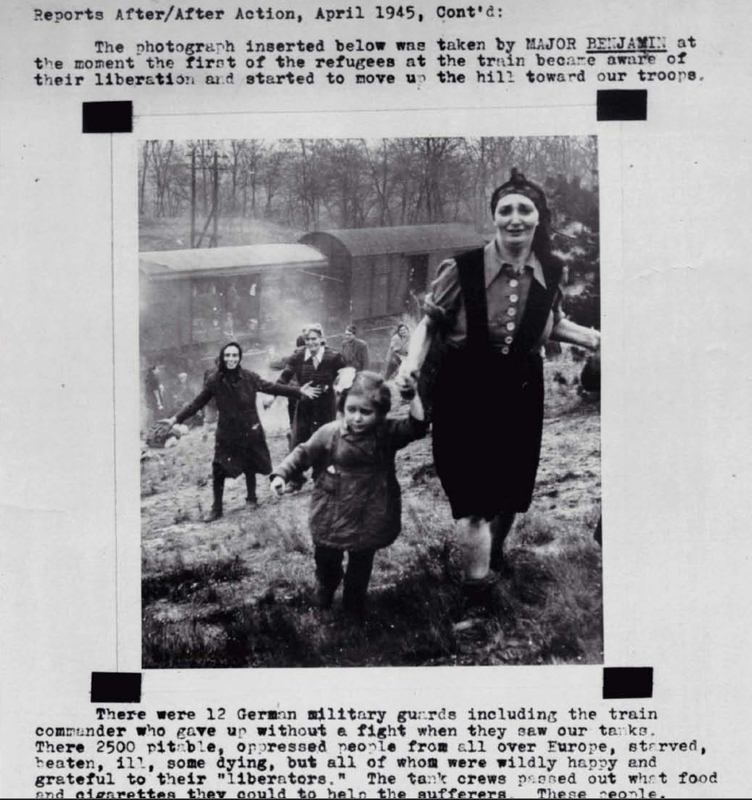 On April 15th, 1945, soldiers of the 11th Armoured Division of the British army arrived and liberated 60,000 prisoners of Bergen Belsen concentration camp. A scene of horror confronted them– thousands of unburied corpses and Holocaust survivors in various stages of starvation and sickness; eight hundred would die on the day of their liberation, and 13,000 more in the following month of May even as the war finally ended. The transport liberated on April 13th by the Americans near the Elbe River had left this camp seven days before. The logbook for the 105th Medical Battalion of the 30th Infantry Division was kept by T/4 Sgt. Wilson Rice, who interjected colorful personal commentaries when typing up his reports. At Letzlingen, Germany, we pulled off of the road to wait. Here Major Lowell, Major Huff and Tommy met us. They had gone back to Brunswick to see about getting the soldiers of ours out of the German hospitals, and to see some other hospitals. Col. Treherne also met us there. While we were parked here the forward command post came along. I went out to one of the trucks to talk to some of the fellows from headquarters. They had a German on the truck and he was most unhappy. He was one of the few who ran before he was captured, and before he was caught, he tore off all of his markings and insignia off of his uniform. Nasty little Nazi. They couldn’t find a place to get rid of him, so Paul Huff and I put him on the hood of our jeep and took him into town to the PW [prisoner of war] cage. On our way back, we passed another walking down the road, but we were in a hurry. He was smiling and just as happy about the whole thing. We just merely pointed the direction, and everybody went merrily on their way about their business. When Major Lowell, Major Huff and Cardwell left this area, I went with them. Farther on down the road, when the convoy was halted again, Major Marsh from the Military Government drove up to Col. Treherne’s jeep. He told him about a train of civilians that were prisoners of the Germans. Our jeep pulled out from the convoy and went to Farsleben, Germany, where the train was located. Also in this town was the command post of the 823rd Tank Destroyer Battalion, and we stopped there to pick up Capt. Baranov, the 823rd Bn. Surgeon. He took us down there, and it was something that you’ve read about, but couldn’t believe. They were people that looked of being very refined and cultured. It is said that among the people, was the French Consul to Germany. Some great minds were among these people. There were two doctors that were members of the train, and they were caring for the people the best they could without any equipment. Capt. Baranov’s men came up with a few drugs bandages, etc. to use until they could get more. It was about the same as nothing, but it was to go to the women and children first. About 75% of the members of this train were Jews so the drugs etc., were given to the two doctors and the Rabbi for distribution. Major Lowell and Major Huff told them to get all of the contagious and seriously sick to be segregated into cars by themselves. These cars that they were traveling in were boxcars. Sanitation was terrible and the people had been traveling in them for eight days and nights, without food or water. Most of the sickness was due to malnutrition. There were only two typhus cases. 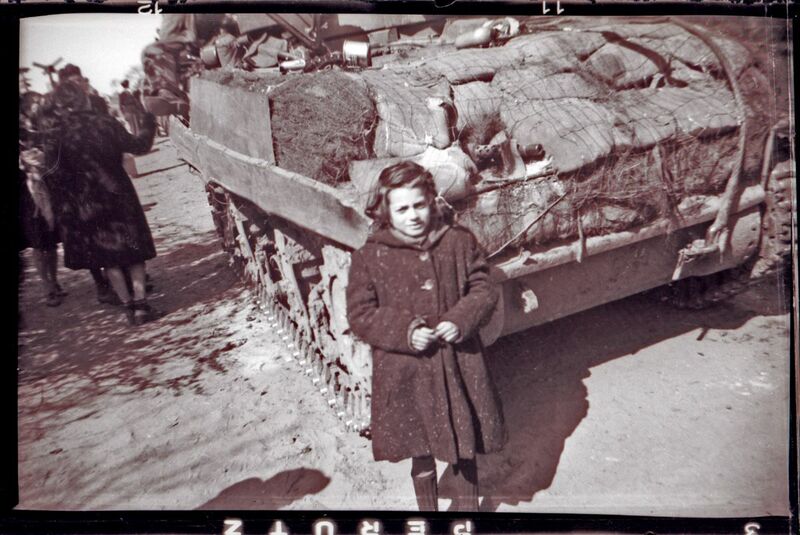 Liberated Girl as photographed by SGT. George C. Gross, Sat. morning, April 14th, 1945. Farsleben, Germany. This G.I.’s simple eyewitness account is moving beyond words.